In Burgundy on the navigable River Yonne, Auxerre is an inland port with a lovable old town and solemn churches that power above the skyline. Those old religious buildings are even more ancient than they appear from the outside: The Abbaye Saint-Germain goes deep into the Dark Ages and has the earliest Christian church frescos in France in its Frankish crypt. On the carless streets you’ll never tire of Auxerre’s creaking timber-framed houses, or the twee Quartier de la Marine neighbourhood where people made their living from the Yonne and Nivernais Canal. These waterways are waiting to carry you off into Burgundy’s vine-laden countryside on a self-guided voyage for a day or even longer. The awesome Gothic cathedral was started in 1215, on a patch of land hosting a long line of religious sanctuaries since the 400s. Auxerre Cathedral rivals any in northern France for the splendour of its portal sculptures and stained glass windows. It’s the latter that are most treasured, particularly the lancet windows in the choir’s ambulatory. Here there are 32 windows from the first half of the 13th-century, adored for their piercing blues and warm reds. The three huge rose windows are later, from the 16th century but also inspiring. The crypt is Romanesque, from the 1000s and has astounding frescos from the 1100s and 1200s and its apse chapel. Above ground this former Benedictine Abbey has 13th-century architecture, while damage to the nave in the revolution separated the Romanesque tower from the body of the church. Below ground, the Carolingian crypt is a wonder of the Early Middle Ages: With a story that goes back 1,500 years the crypt is a multilayered archaeological site with information boards. A grated walkway traverses these ancient foundations, and there are compelling fragments of stonework in display cases. The frescos date to between 841and 857, making them the oldest in France. Here you’ll set your eyes on art that mostly only exists in illuminated manuscripts and has lasted so long because it had been plastered over and only found again in 1927. If you need a place to start, the pedestrian bridge crossing the Yonne gives you a photo-friendly perspective of Auxerre and the towers of its cathedrals and churches rising above the skyline. There’s enough history in the centre of Auxerre to designate it a protected zone, and you’ll have a dizzying amount of medieval buildings to ponder, some with corbels that project the upper storeys over the street. The tourist office will give you an itinerary of all the sights to keep your eyes peeled for. One of the loveliest streets is the hilly Rue Fécauderie, and here you should look out for the carved timbers on the houses at the junction with Rue Joubert. Auxerre’s water-based trades were found by the Yonne a few streets from the city’s main core, so this endearing little neighbourhood of scurrying lanes has its own personality. Living and working here were all the families that relied on the Yonne, whether they were water carriers, boatmen, tanners or merchants. You’ll start to understand how this landlocked city was part of a massive network that put it in touch with both the Mediterranean and North Sea. The names of streets and squares, like Place Saint-Nicolas, patron saint of sailors and merchants, are redolent of the activity that would have filled this quarter centuries ago. 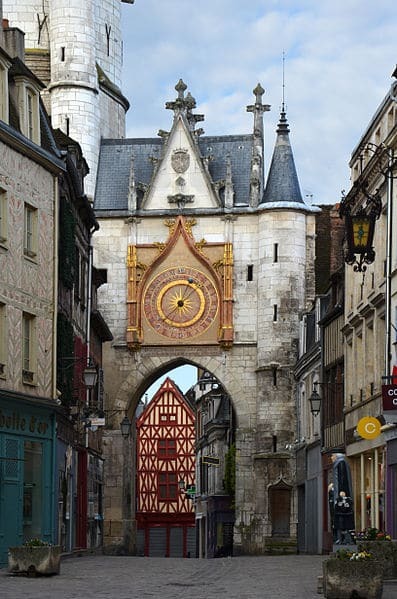 An eye-opener on a tour of Auxerre’s pedestrian centre is the 15th-century clock tower, which has delicate Gothic ornamentation. The clock face, crafted in the 1600s, is gilded, and rests on a decorative turreted arch propped up to the side of the main tower. Take a minute or two to study the clock’s unusual format, measuring solar and lunar movements with two long hands and two dials. The tower itself replaced one that was part of the Gallo-Roman wall, and has a circular plan and slate spire. It had been a prison before being converted to a belfry in 1483. The subject of the enduring children’s song “Cadet Rousselle”, Guillaume Rousselle was Auxerre’s eccentric 18th-century town crier who became a figure of mild derision during the Revolution. The song spread far and wide in the 1790s when men from Auxerre who had joined the National Volunteers shared it with people from other regions of France. 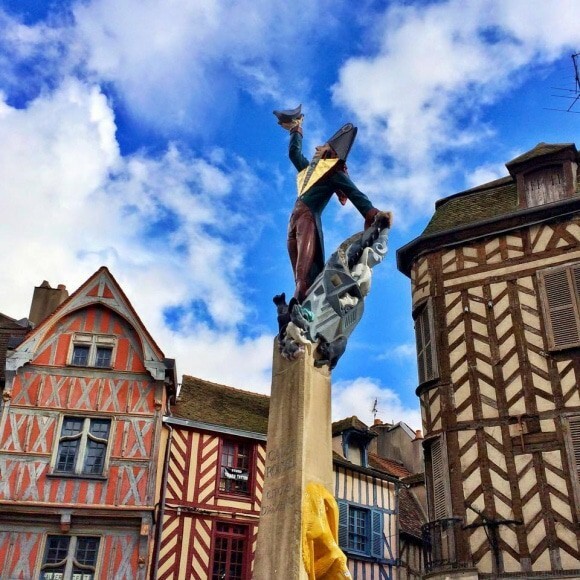 The statue in the Old Town was designed by François Brochet, and there are brass arrows embedded in the ground guiding you to where Rousselle lived and worked in Auxerre. The local football team’s glory days are behind it, but something remarkable happened at the Stade de l’Abbé-Deschamps between the 1960s and 2005. For all of this time there was only ever one man in charge: Guy Roux’s longevity as head coach is almost unheard of in the sport. He led them from amateur level to a Ligue 1 title in 1996. Football historians may want to see a match at the stadium where legendary players like Eric Cantona, Basile Boly and Laurent Blanc cut their teeth. The team is down in Ligue 2 and you can turn up to the stadium on any match-day for a ticket. 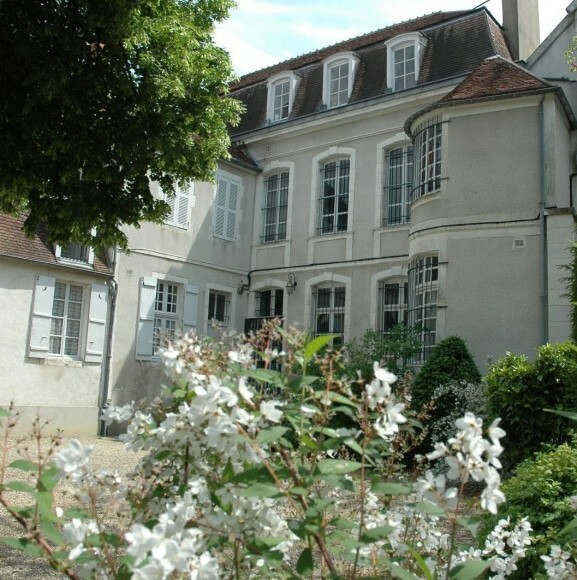 Paul Leblanc-Duvernoy was a well-heeled Auxerre local and an ardent lover of the arts, putting on concerts in his fine house on Rue d’Egleny for a large circle of friends. In 1926 he bequeathed his home and its hoards of painting, furniture and tapestries to the city. From the decor, furniture and art you’ll know that Leblanc-Duvernoy had a taste for the 18th century. The museum shines for its ceramics, with Revolution-era faience that is held among the most beautiful collections in France. These are set in the apartments on the first floor, while the attic has as complete a set of Puisaye sandstone pottery as you’ll find anywhere. In a resplendent Louis XIII-style mansion to the west of the old centre, Auxerre’s Natural History Museum is a window on the region’s biodiversity and geology over millions of years. These 80,000 specimens have been gathered across two and a half centuries and represent fields from mineralogy to palaeontology. Almost of 60 of these, mostly the fossils of fish and crustaceans, are seen as scientific reference points. But for the casual visitor the high points will be the skeletons of prehistoric bears discovered at the Caves of Arcy-sur-Cure and a stroll around the museum’s botanic garden. Louis-Nicolas Davout, Napoleon’s “Iron Marshal”, was born in Annoux not far southeast of Auxerre. 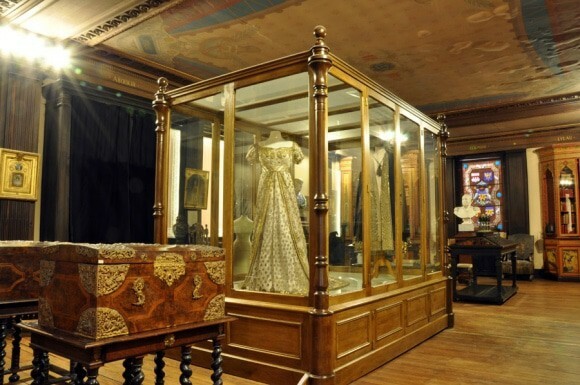 In 1882 the last daughter of the famous commander set up a room of Davout memorabilia in Auxerre’s Palais des Comtes. This was closed for the last few decades of the 20th century but opened again in 2012 and is a fascinating and intimate look into his life. You can admire the uniforms he wore to Napoleon’s coronation in 1804 and to the Emperor’s wedding with Marie-Louise’s in 1810. There’s a library with 2,500 books and a large collection of the marshal’s personal correspondence. 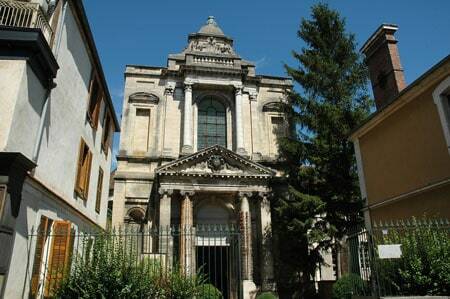 Open in summer on Rue de Paris this chapel was built in 1714 for a convent and is a well-proportioned example of the Jesuit Baroque style. The symmetrical interior plan is in the shape of a Greek cross, which has arms at equal lengths, and is the only church in Auxerre with this kind of layout. The elliptical dome is marvellous, but besides the architecture you should step inside for the exhibition of polychrome sculptures by François Brochet. This 20th-century artist was an Auxerre native and you may recognise his work at a few places around the city, including the statue of Cadet Rouselle. Damaged and rebuilt a few times over the last thousand years, the Église Saint-Eusèbe is one of those historic churches with an engaging fusion of architecture. The oldest section is the Romanesque tower, dating to the first years of construction in the 1100s. The painted rib vaults in the nave are Gothic, but the choir, the brightest part of the newly restored interior is from the Renaissance. This is the most beautiful part of the interior, where the ample stained glass windows give the white stone of the choir’s pillars an ethereal glow. The Nivernais Canal roughly follows the route of Auxerre’s Yonne, and when it was completed at the end of the 18th century the waterway linked two of France’s great rivers, the Loire and the Seine. 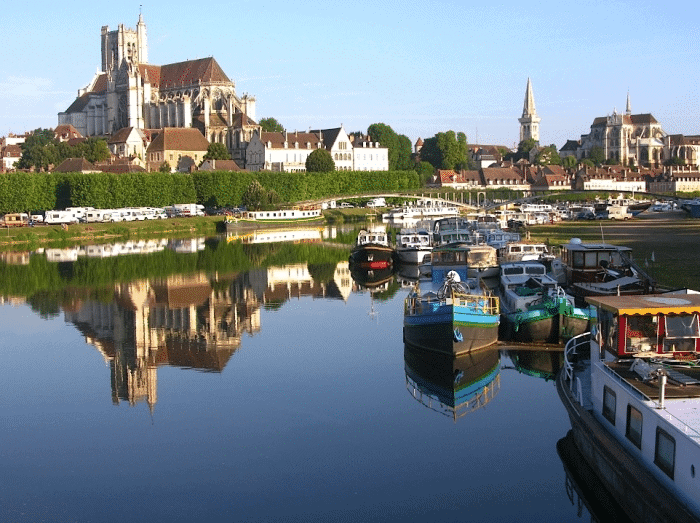 Where it once shipped Burgundy wine to Paris, the canal is now all about pleasure, and Auxerre is the base for a load of tour operators and hire companies. You can rent an electric boat to admire the city sights from the water, or go on an extended jaunt into the countryside where the canal passes pretty wine villages. There’s also a 90-minute commentated tour aboard the Hirondelle, which gives you the background on Auxerre’s once bustling river industries. You need only look at a map and read names like Chablis, Irancy and Saint-Bris to know that this is a dreamland for wine-lovers. The Chablis region starts just east of Auxerre and produces white wine exclusively with Chardonnay grapes. The cool climate this far north gives Chablis its famous dry and sharp flavours. Drop by at Domaine Alain Geoffroy or Domaine Alexandre for the full vineyard experience. The town of Irancy is in a hollow between bulky chalk hills, which keeps its vineyards out of the worst of the winter weather and gives us the best local red, made with pinot-noir grapes. Burgundy’s amazing food is yet another facet of the region’s allure. And many of the local signature dishes are enjoyed around the world and seen as typically French. Wine is a big ingredient in several of these recipes, like beef bouguignon and coq au vin, two much-loved stews that follow similar methods and have mushrooms, carrots and lardons. 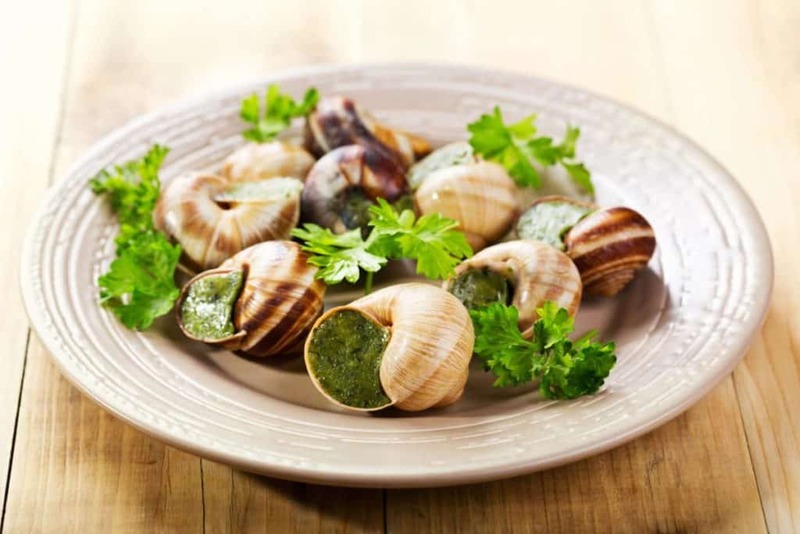 Also held as a national dish is escargot de Bourgogne, in which snails are cooked in the shell with parsley and garlic butter. 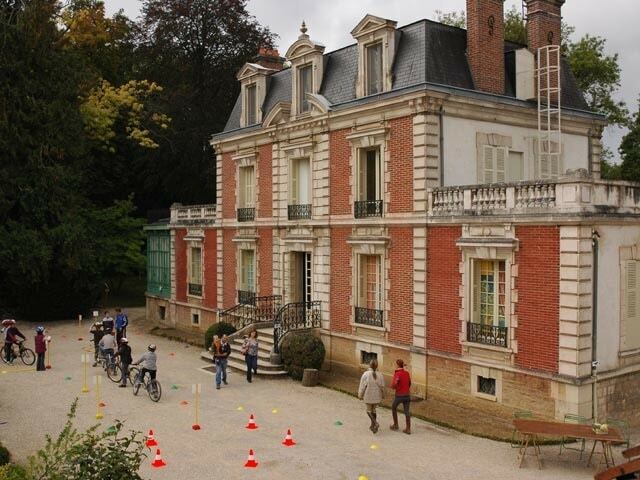 Tonnerre, east of Auxerre, is the home of the Gougère, little balls of cheesy choux pastry.